A similar scheme was approved at Aikey Brae despite protests. Efforts to block a controversial traveller camp at a former council depot have already attracted more than 250 signatures. A petition to block the redevelopment of Boyndie’s depot into a 15-pitch stopover site was launched earlier this month and has so far been signed by 290 people. The scheme has also drawn concern from the area’s community council which has objected to the plan in what it has described as a “rare” move. 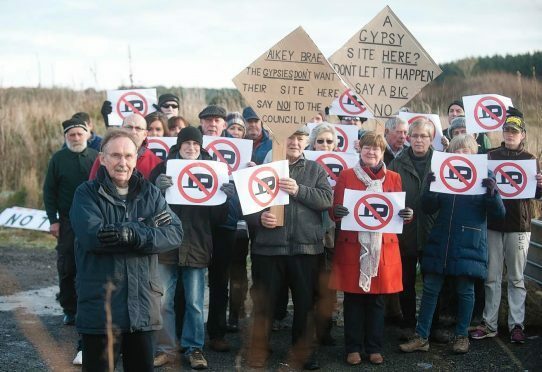 Whitehills and district’s community council told local authority planners that it almost never objected to applications, but had been contacted by “numerous local residents” who had expressed fears over the A98 Banff to Portsoy road, close to where the camp will be built. Lynne Bevilacqua, who started the petition, had also raised concerns about the safety of the route. She said: “There have been many motoring fatalities on this stretch of road and many more accidents. In its letter to planners, a spokesman for the community council added: “We can’t remember the last time we made a planning objection. The application for the camp has been made by Banff architecture firm Mantell Ritchie on behalf of Boyndie Depot Developments. Last night, agent Michael Ritchie declined to comment. Forty-nine members of the public have written to Aberdeenshire Council over the scheme. All of them have objected to it. The scheme for Boyndie comes just months after councillors approved a similarly controversial bid to create the region’s first official stopover site near New Deer at Aikey Brae. Travellers there will be able to stay in the area for up to 28 days at a time.